The sturdy soft padded leather purse is large and roomy enough to fit all your belongings. Genuine leather exterior. Size: 12" W x 5" H x 1.5" D. Color: Goldish silver, very reflective to light. Turquoise Blue Beaded Lace Evening Bag Clutch. Condition is Pre-owned. Gold toned ball clasp and chain handle. Made from premium Acrylic.This cute handbag has rectangular hard body and large inside space. The internal pocket fits for large smart phone like iPhone 6 Plus and even have more space and also can easily carry your sunglasses, lipstick and more. Clear transparent color,gold metal frame lined and hasp closure. Cut and fancy apperance. The golden button on the top make this bag easy to open and close. Come with a Detachable chain, fits for your different needs for different occasions. Easy to match and suitable for any style of clothes, A Head Turning Bag That You Must Have! 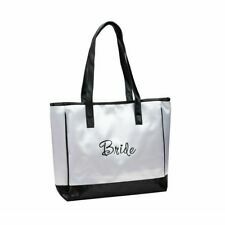 Specifications: Material: Acrylic hardware Colour:Clear Acrylic Purse size: 7.08* 4.33* 1.96 inch (18x11x5 CM), Detachable strap: 47 inch (120 CM) Package Included:1 x.
Purse RHINESTONE Bling Silver. Handbag Clutch/Strap Swing. see other purses listed. Photos Show All! 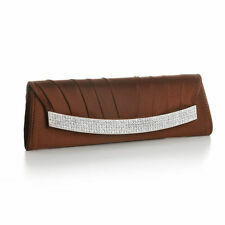 Simple , elegant clutch. It has a tiny slight scuff mark on one side, but was only used on one occasion. From a non smoking home. 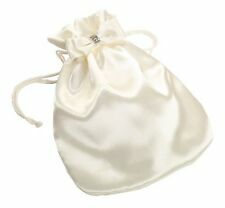 This white satin multi-colored beaded evening purse can be used as a brides purse or just a regular evening purse. The beaded handle is made of large flower design beads separated by clear Crystal beads. PROM, wedding, special Evening or event. pleated detail on outside. satiny feel to clutch purse. has long cord handle-- you can use it or tuck inside. many things fit into envelope. Very sweet little purse handbag. Very finely crocheted and lined with satin. For Prom Bride Wedding. Pearl,Crystal Beaded Evening Handbag. NEVER USED. In's Beautifully Soft Mint/Light Green / Multi-colored Beaded evening handbag. Women's satin flap shoulder clutch bag features pleated bow with metal embellishment, inner pocket and lining, magnetic snap closure, and detachable chain strap to easily convert bag to hand or shoulder style. 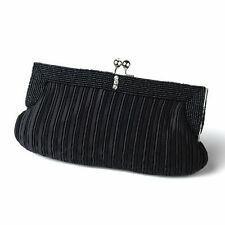 CARLO FELLINI SILVER SATIN/BEAD/SEQUIN EVENING CLUTCH WITH LONG CHAIN $79. Pink "Bridesmaid" Tote Bag. 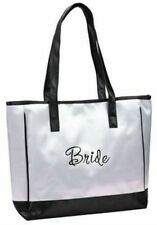 The front side is embroidered with the word "Bridesmaid" in black. 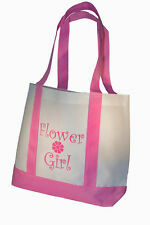 This stylish pink tote bag makes a great gift for bridesmaids. Also available in a pink "Maid of Honor" version and a white "Bride" version. Embellished Antiqued Gold Fabric P.M. 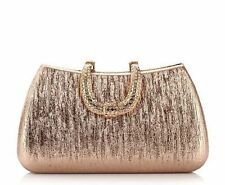 Bag With Decorative Metal Strap, New !